NPR | Got a confidential news tip for NPR? At NPR, we welcome your news tips. Here’s a guide to getting in touch with our newsroom and how to share sensitive information. 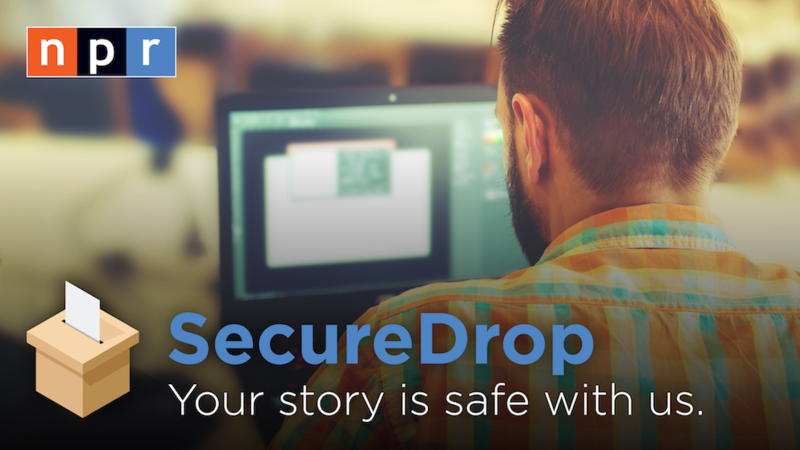 SecureDrop is a secure, encrypted system that allows you to send confidential information to the NPR newsroom about a story you think is important and needs to be told. We use Tor anonymity software, which enables you to send data while protecting your identity and location. We recommend that you use a public Wi-Fi, not your own personal or professional Wi-Fi connection. Download the Tor software here. This enables you to have a secure communication with NPR. Follow the instructions about how to send us the file(s). Once you send us information, you will be given a code name so that you can come back and track follow-up response from NPR. Email Investigations@npr.org. Or use the option on our Contact Us page to send a note to a particular show or podcast. Please include a way for us to contact you and follow up. You can also connect to many NPR journalists on Twitter.